A sleek, compact machine designed to make you high-pressure-brewed coffee in just a minute, the Jura Impressa C5 makes programming your coffee or espresso a simple matter of turning a few dials. 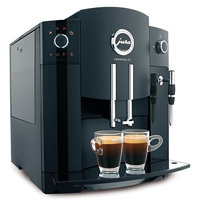 It accepts either grounds or beans and makes a variety of coffee, from ristrettos and espressos to lattes and cappuccinos. While the compact coffee maker won’t take up too much space on your counter, it hides away an ample 7-ounce bean container and a 64-ounce water tank. For $868, this Jura machine is an affordable purchase that produces thick, crema-topped drinks quickly.